A growing number of Y-DNA test takers since 2007 have helped to provide a significant number of unique genetic lineages of Babbs that are NOT genetically related to each other. Additionally, a large variety of 60+ pedigrees remain untested. We are actively looking for people to join our project and help us link up the many known pedigrees into larger DNA-Proven lineages. Y-DNA is named as such because it tests genes on the Y-Chromosome that are passed along from Father to Son. It’s results are limited to this narrow definition, but its strength is in isolating results along the surname of the male test candidate and allows for a simple yes/no answer about relationship to another male test candidate. If the answer is yes, an estimate of the distance between the two men (ie. 3rd-4th Cousins) can be projected and the two people’s known lineages are compared to look for who that common grandfather would be. It is only by blending traditional Genealogical research with the DNA test that you are able to produce the hoped for answer. As of Oct 2017, 7 genetic lineages of Babbs, in the US and England, are available to compare against your results. Typically a 37 Marker test is sufficient to determine which of the known lineages you are a member of. Our preferred Y-DNA testing company is http://familytreeDNA.com. If you have Y-DNA tested somewhere else, we need to import your results into Family Tree DNAs database so that we can have everyone in the same place. Make sure to join the Babb surname group so that I will be able to see your results. Contact me (Daniel Greig Babb) for more info on how to get your results included in our database and provide details as to which test service you used. The tests offered by 23andme and Ancestry are typically based on a different type of DNA known as Autosomal which is only accurate up to about 5 generations. It has a broad scope and will show others in the database that bear relation to you along with an estimate of the relationship distance (ie. 3rd-4th Cousin, sister, etc). Family Trees can then be employed to figure out where in your tree the connection may have occurred. A key difference here is that the relation can be through any of your grandparents and not just those along your surname tree. So, the results might help unlock family connections for adoptees that would significantly narrow the scope of your search. Females are able to take an autosomal test, which can help connect more recent cousins and solve 19th and 20th Century questions about lineages. Regardless of where you took your autosomal DNA test, you can join our DNA group for FREE by importing it via https://www.familytreedna.com/autosomal-transfer. Make sure to join the Babb Surname group so that everyone in the group can easily compare and share. This type of testing provides a very narrow scope and is only good at providing a yes/no answer of relationship based on the amount of common DNA between the two candidates. Beyond this one question, its application to larger Genealogical questions is of limited use. Adoptees and those looking for broader answers about Non-Paternal events will likely be best served by the Autosomal DNA test mentioned above. If you still have questions that need to be answered, or if your situation is more complex please contact me (Daniel Greig Babb) and we can discuss it privately to help you get to the bottom of things. There is much I still do not understand about DNA research, but I’ll guide you to the best of my abilities! The next step is to Upload your family tree (Contact Me if you need assistance on this part). After that you can start to look for your cousins. 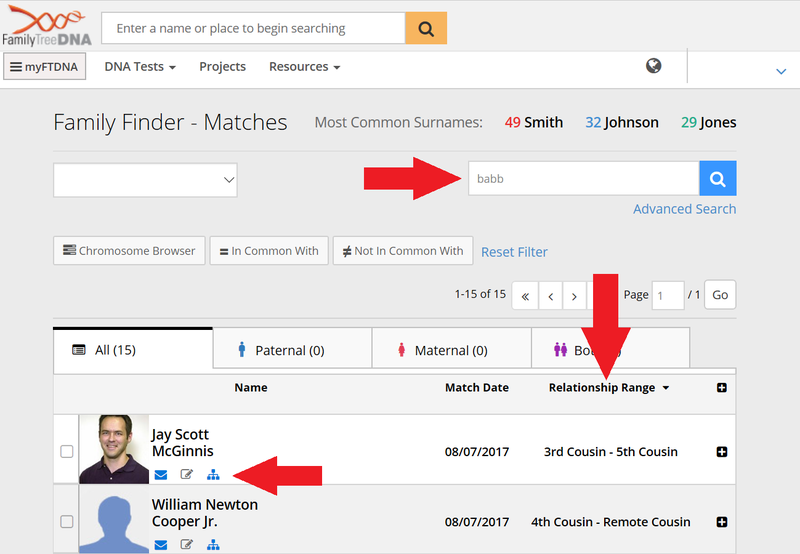 To view your Family Finder Matches, which will take you to the page shown below. Then Type Babb in the Search box as shown below and sort by Relationship Range. Here you can contact your cousins or view their family tree using the links provided to the right of their picture. Please notify me of your test results so I can make sure to capture the data in the “Master File” that you have tested so that I can use that info as others need to match.